One of the BEST parts about being a blogger in Pittsburgh (aside from the occasional retweets from Rick Sebak and Edgar Snyder) is being part of an amazing community of bloggers and blog readers. The readers of this blog, and many other blogs and websites have raised awareness and money for so many amazing Pittsburgh projects. A few years ago, another blogger asked me to help Community Human Services, a local nonprofit raise a little bit of money to be able to provide holiday gifts for some of the people that they serve each year. Over the past four years, I have had the opportunity to learn more about Community Human Services and how important this Holiday Gift Project is to the people they serve. Last year it was a but of a struggle to reach our goal of raising $5000 for CHS. So this year, we’re starting a little bit earlier and asking for your help. Scroll down for lots more information about Community Human Services and the 2014 Holiday Gift Project. The best way to help is to make a donation of $10 (or more!) to the 2014 CHS Holiday Gift Project on Crowdrise. I wanted to share with you just one of the reasons that I am supporting CHS this holiday season. Over the past four years, I have had the opportunity to meet the staff at CHS and learn more about the many programs and services that they provide for the Pittsburgh community. Two years ago, I was standing at the Holiday Gift Project party at Houghs talking with one of the women who works for CHS. She was thanking me over and over for helping them to raise a little extra money. I asked her what she does for CHS and her story, really cemented for me why this organization is important to our community. She works with homeless teenagers who have left the foster care system. Once you turn 18, if you are in the foster care system in Allegheny County, you are able to sign yourself out of the system. Many of the kids leave the foster care system and end up homeless. The staff at CHS, does what ever they can to find these kids, and work with them to find stable housing. These kids, like many of other Pittsburghers that CHS works with in the community are often overlooked during the holiday season. Many of the people who CHS works with – fall outside some of the other gift projects, which most often provide gifts for young children and the elderly. It is my goal to once again DOUBLE the number of people who support the CHS holiday gift project. I hope that you will take a moment to learn more about CHS, make a small contribution to the cause and invite your friends to do the same. Thank you in advance for reading IheartPGH and your support of this one little campaign to make the holidays a little bit brighter for some other Pittsburghers. 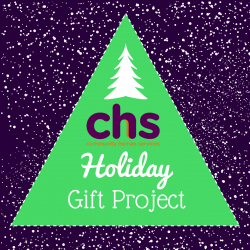 Donate online – The BEST way to help is to make a donation on the CHS Holiday Gift Project Crowdirse page. Invite your friends to donate – Crowdrise makes it easy for you to form a fundriasing team and invite your friends to give $10 as well. Visit this page and click the gray “Join The Team” button to get your own fundraising link for the CHS Holiday Gift Project. Clean our your closet for a good cause – click here to learn more about how you can join the CHS ThredUp group and turn your unwanted clothes into cash. Join us for the 2014 CHS Holiday Gift Project party on Thursday, December 11, 2014 at Hough’s in Greenfield. Click here to RSVP on the Facebook event page. Crowdrise is a website that lets anyone create a fundraising page for a registered nonprofit organization. All funds raised on the Crowdrise page go to CHS. The Crowdrise platform sends the money directly to the nonprofit. IheartPGH does not touch the money or earn any funds from the Crowdrise page.